Located on the corner of our “Harbour” and the beautiful Hawkesbury River. Bayview features a well – fitted kitchen, a double bed, a pull-out double sofa bed, a single bed and a trundle. A semi shaded outdoor entertaining area, with camping sites on either side, it has its own open camp fire and bbq where you can witness the spectacular sunsets. The fisherman’s retreat, features an open bbq area leading onto a jetty. Sleeps six – a double bed, double sofa bed and double bunk beds. The small kitchen is equipped with cutlery, crockery, cookware, a kettle, toaster and microwave. A 70’s style caravan sleeps six – a double bed, a futon/lounge, single bed and trundle. This van features a large paved entertaining area with bbq facilities that adjoins the “Waterview”. 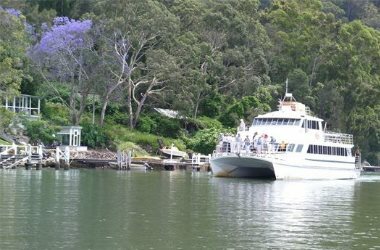 The Parkview also leads to the pontoon where guests can enjoy the sunset and watch the river trawlers harvest the renowned sweet Hawkesbury River prawns. Set amongst the mangroves, this van features a large paved bbq area which adjoins the “Parkview” ideal for family or sporting groups. It opens out to a grassed area extending the entertaining area where a tent or two can be pitched allowing for riverside camping for the group. A double bed, a double bunk and two double futon/lounges allows sleeping for six to eight. Just a hop, skip and jump from the waters edge, “Baitup” features a fully equipped modest kitchen. A double bed and triple futon / bunk, allowing sleeping for up to five. The small covered deck opens onto an open paved area with bbq and open fire that encourages guests to swap their fishing yarns and tall stories.